On June 24, Pixar journeys back to Radiator Springs for its12th feature-length animated film, Cars 2. Below are the latest character images plus some concept art from the new movie. In Cars 2, hotshot racer Lightning McQueen (Owen Wilson) enters the World Grand Prix, an international competition to determine the world's fastest car. This time, though, Lightning is no longer the arrogant rookie he was in Cars. He's now a respected veteran and winner of four Piston Cups. Needing a first class pit crew, Lightning enlists the help of his Carburetor County buddies. 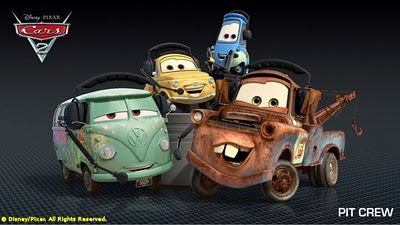 Hippie VW Van Fillmore becomes his fuel expert, scrappy Italians Luigi and Guido take care of tires, and Lightning's best friend, the dim but loyal Tow Mater (Larry the Cable Guy), becomes crew chief and takes his first ever trip outside of Radiator Springs. Every international racing team needs a solid security detail, and Army Jeep Sarge is up to the challenge. All this thrill-packed racing and espionage takes our heroes to some exciting destinations. Here's concept art showing Lightning in action at these worldwide locales. Like the first installment, Cars 2 is directed by John Lasseter, chief creative officer of Walt Disney and Pixar Animation Studios and principal creative advisor of Walt Disney Imagineering. In select theaters, Cars 2 will be shown in Disney Digital 3D and IMAX 3D.